The Original Wham-O Super Ball - - The "Most Amazing Ball Ever Created By Science." Welcome to superballs.com, my tribute to "the most amazing ball ever created by science." Tired of bouncing icons? Click browser "stop" (at just the right time:)... or go here ! The 2001 Super Ball Keychain - Revisited. 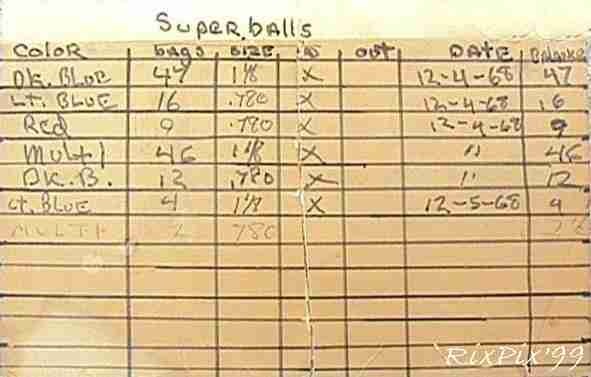 Check out some Wham-O Super Ball products that never flew!!! Click here to see some great old Wham-O Super Ball commercials ! You voted the Super Ball as one of "The Greatest Toys of the (last) Millennium"
The Super Ball is featured on the History Channel's "Modern Marvels - 60's Tech"
Copyright 1999 - 2017 Superballs.com , All rights reserved.